As careless with an image of Christ as he is with his Church. Is he going to try and repair the fissures that come out after the Synod with gaffer tape. A quick spray of silver paint over the tape and nobody would have noticed the difference! Am I allowed not to like the quasi-Giacometti Jesus figure or is that a standard interpretation? The rest of the reel of tape should be deployed over that extemporising pontifical mouth whenever the press are lurking on aeroplanes looking for a feel-good sound bite.......... but, then again, who am I to judge? The tape is simply a bit of innvovative 'brutalist' art and design - a meaningful comment on the revolutionary brutalism of the Paul VI ferula and how such a revolutionary muse can apply instant sticky tape solutions to all problems. - painted by a man Paul VI had invited to his audiences for over two years. Do you see what I see? Just testing the new format. Brilliant caption by the way! 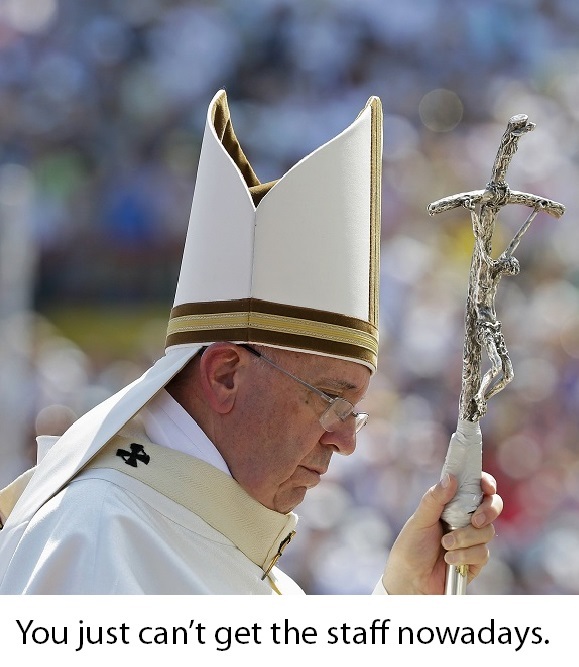 Louie Verrechio has posted a great article on The Inversion of the Priesthood by Pope Francis. not a man's man. he should carry that like a weapon. not a taped up broken sad thing. he's awful i can't look at him lately. It could just be for added comfort to present blisters and ulceration?